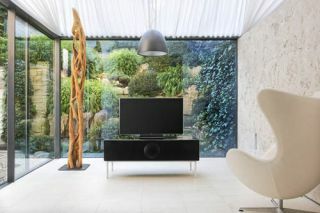 Geneva unveils Model XXL home cinema and music sound system | What Hi-Fi? If the idea of a space-saving cabinet that combines a complete home cinema and music sound system with a full range of steaming audio options sounds good to you, then the new Geneva Model XXL will be of interest. The high-end Swiss audio company says that its new Model XXL, a sort of monster soundbar meets soundbase, brings together "visionary audio design" and TV into one single, slender cabinet. At just over 1m long, it is able to support TV with screen sizes up to 65in. Available from this month with a guide price of £2499, the Model XXL will connect to a whole host of home cinema and audio devices, as well as smartphones and tablets, and has seven speakers, each individually powered by Class D amps, and an 8in subwoofer. The Model XXL comes with DAB and FM radio; Apple AirPlay and Bluetooth A2DP streaming, plus seven analogue/digital inputs – including three HDMI 1.4 connections. Meanwhile, storage space for components including a set-top box, games console or Blu-ray/DVD player is hidden by the full-length grille. The connections are also hidden at the rear of the XXL's cabinet. In terms of technical specifications, the seven speakers – including two 1in tweeters and an 8in subwoofer – are housed in five acoustic chambers and are driven by dedicated DSP-tuned amplifiers. As well as those seven speakers, the Geneva XXL also has "advanced 3D audio processing". Geneva says: "Its high fidelity audio performance will also get the most from phones, tablets and PCs, and range of radio options, all contained by a beautifully minimalist design in the classic Geneva style." It's available in red, black and white and is due on sale this month for £2499.